The Oregon football team was back at work early Thursday morning. With only three practices left until the spring game on April 20, the Moshofsky Center was loud and energized. The Ducks started as they always do with dynamic warmups before moving into more position-specific drills. However, they did add a tackling drill and a ball security segment into the mix. Right after warmups and just before the position drills, the Ducks got a chance to go back to the basics -- ball security and tackling a moving target. From there, the Ducks got back to routine and split up into offensive and defensive units. 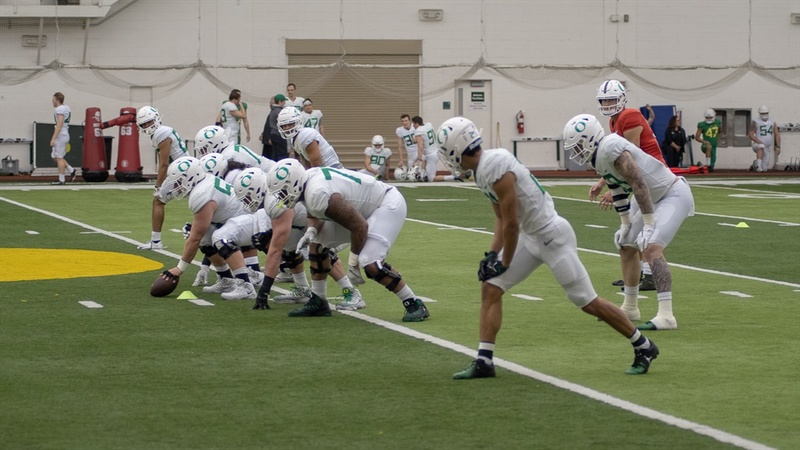 The Oregon offense ran a few plays each for the first and second teams -- employing the same lineups as in previous practices -- before breaking off into position drills. There did seem to be a bigger emphasis on catching the ball, as the wide receivers and tight ends ran a receiving drill with simulated man-to-man defense. On defense, the secondary practiced everything from tracking the offense to tackling and catching. The defensive line practiced explosiveness off the line and tackles. One last notable, after a short absence from action, Jevon Holland and Josh Delgado returned to practice on Thursday.